Summer is over. Fall is here. Winter is fast approaching. And still, we have yet to see a trailer for Sony’s Christmas scifi movie Passengers. This isn’t some small movie either. It stars Jennifer Lawrence and Chris Pratt, plus the footage that was shown to exhibitors back in April looked amazing. The first poster has just made its way online, so hopefully that means Sony will release the trailer soon. Here’s the poster for the movie, which is about what happens when two passengers on a space ship (Pratt and Lawrence) wake up 90 years before they’re supposed to. The poster doesn’t give away much information about the film, but that makes sense. Passengers stars two of the biggest actors in the world. The premise—cool as it may be—is secondary. That this is only the second piece of marketing we’ve seen with three months until release, is pretty crazy though. Passengers, written by Jon Spaihts (Prometheus) and directed by Morten Tyldum (The Imitation Game), opens December 21. Odds are we’ll get the first trailer in the next week or so. *Correction: We switched the poster out with the official, high-res version. 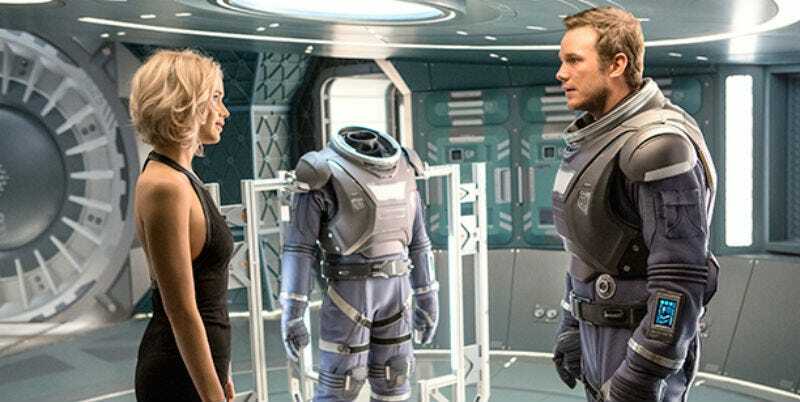 Will Jennifer Lawrence And Chris Pratt Star in Scifi Drama Passengers?